A no-confidence motion in the EU’s new chief executive Jean-Claude Juncker had no chance of success after the Eurosceptic lawmakers who brought it traded insults with the bigger parties in the European Parliament on Monday (24 November). 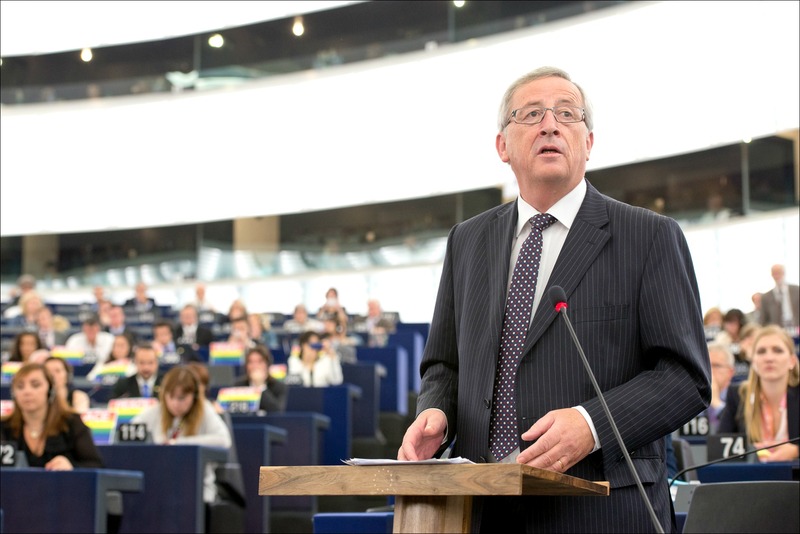 Backed by anti-EU groups including the UK Independence Party and France’s National Front, the motion calls for Juncker to be removed, less than a month after taking office, because of his role in controversial corporate tax avoidance schemes during his long tenure as prime minister of Luxembourg. The Commission is taking this challenge very seriously, and the whole College of Commissioners, except Günter Oettinger, made the journey to Strasbourg to take part in the debate. On 18 November, Nigel Farage’s group, the EFDD, announced that they had collected signatures from 76 MEPs (44 EFDD and 32 non-attached members), reaching the threshold necessary to force a motion of censure. According to procedure, the motion must be debated in the plenary session. In order to be adopted, forcing the whole Juncker Commission from office, the motion needs a majority of two thirds in the European Parliament. But big parties on the right and left, representing far more than the blocking one-third minority required to thwart the motion in a vote set for Thursday, defended the conservative Juncker and criticised the Eurosceptics for playing what centrist leader Guy Verhofstadt derided as a “little game”. The radical left GUE/NGL group had also tried to gain support for a motion of censure against the Juncker Commission following the “Luxleaks” scandal, but failed to collect the required number of signatures, having refused to join forces with MEPs from the extreme right. Eight such votes have taken place in the history of the European Parliament, without ever being adopted. The authors of the motion accused the President of the European Commission of being the cause of all Europe’s problems. Speaking for the motion, National Front leader Marine Le Pen addressed Jean-Claude Juncker, saying “you are clearly responsible of having allowed this large-scale tax evasion to take place. No right-thinking person would believe you could now fight firmly and sincerely to undo what you have done. This would be just as credible as naming Al Capone as President of an Ethics Committee”. She added that Jean-Claude Juncker was “not the only, but the best example of the monster that the Union has become”. The European Socialists and Democrats believe the European Parliament’s extreme right has wanted for weeks to bring a motion of censure against the Commission, which it has opposed since the outset, and has found a convenient excuse in the “Luxleaks” affair. Their motive, according to the S&D group, is to “make Europe ungovernable and destroy the trust of Europe’s citizens”. But they too are sensitive to the extreme right’s arguments about tax evasion. “The fact that Juncker is not a credible leader in the fight against tax evasion is self-evident,” one French Socialist MEP admitted. The sharpest exchanges in the debate came when Guy Verhofstadt, the leader of the Alliance of Liberals and Democrats, criticised the “perverse logic” of the motion. He said that by cooperating on the motion with the outspoken Le Pen, UKIP had shown it was “racist, xenophobic and Islamophobic”. He also called Nigel Farage, who has an offshore bank account in the Isle of Man, a hypocrite. UKIP members demanded that the speaker censure him for lacking respect, but were refused. While it is true that many MEPs would like to see him resign, the President of the European Commission has raised questions over the real motives behind the motion of censure. “Motions of censure affect the whole of the Commission and I feel like I am the only one being questioned,” Jean-Claude Juncker said. During the debate he renewed a pledge to promote a common European Union approach to corporate tax, a plan his defenders noted was unlikely to gain the support of his Eurosceptic opponents. “I asked my colleague, Pierre Moscovici, to work on a directive introducing a system for the automatic exchange of tax information between the 28 member states”. “I would like to think that in your countries, your parties, your national parliaments, you would do everything in your power to make sure the 28 member states follow the Commission along this path. I am counting on you,” He said. This censure motion has little chance of being adopted, in view of Juncker’s comfortable majority in the European Parliament, but even if it is outvoted by a large majority, the reputation of the Commission President will not escape unscathed. The motion is likely to be brought down by its authors themselves, rather than the arguments it contains: the radical left, the Greens, many Social Democrats and even some centrist MEPs have all made similar criticisms of tax evasion. The vote will take place during the plenary session on 27 November. The censure motion against European Commission President Jean-Claude Juncker was tabled by the Europe of Freedom and Direct Democracy (EFDD) Group in the European Parliament, which is led by UKIP leader Nigel Farage. It stated that Juncker, who was Luxembourg's prime minister for two decades until a year ago, was directly responsible for tax policies which are now under investigation by the Commission for unfairly attracting multinational businesses. The motion was backed by an alliance of Eurosceptics and far-right parties, including Britain's UKIP, the French National Front and Italy's 5-Star Movement. Together, they were able to gather the 76 signatures needed to meet the threshold of 10% in the 751-seat chamber to put the motion on the agenda. Leftist parties also tried tabling their own censure motion but failed to meet the required threshold. Leftist MEP later refused to join the motion signed by the far-right. When all else fails, resort to insults. Already Mme Le Pen and Farage is conditioned to that ! And keenly said FN & UKIP and other minorities : they ARE racist, xenophobic and Islamophobic ! However some may not agree the reality and the real mean of the definition ! The motion should not be blocked – but voted on. In the case of Verhofstadt, Belgium is almost as interesting a case as Luxy – who remembers those well known tax washing machines co-ordination centres? Or the on-going massive tax dodging that is such a feature of Belgium (permanently broke – but look at the houses). Le Pen could have used a more credible quote than Al Capone … “as credible as giving Kissinger the Noble peace prize”…. errr oh hang on a minute. As for Verhofstadt’s comment about the Kippers being “racist, xenophobic and Islamophobic” – they are that & more. However, the point under discussion was industrialised tax dodging, not the prejudices of the Kippers & their mates. Still, I guess Verhofstadt needs to stick up for his mate Juncker & looking at the traffic jams each morning from Belgium to Luxy – industrial tax dodging seems to be pretty good for employment in Belgium as it is in Luxy. I used to have some respect for Verhofstadt, it is eroding, by the minute. Can’t understand that one of the les Pens called Marine daughter of Jean-Marie agrees and no-confidence motion against Juncker because she should be proud to regulate it’s own fiscal corps. @ 0.1% under national way !! She’s permanently contradicting herself ! But who blaming then since NO European Clown Council aka elected Mister of this organization wants a federal tax corp protection against “dodging” ! ! However Marine maybe could ask Hollande doing the same tax rules like “Luxy” which will attract more companies in France but she’s so stupid ! Not only UKIP or FN is acting cowardly but a lot of politicians are to blame if there is internal tax competition seeing E.U. state fighting each other loosing companies and jobs ! Either you wants protection constitutionally E.U. wide but if not then don’t blame other for your own rules ! !